1926 - John Dickinson Mill. 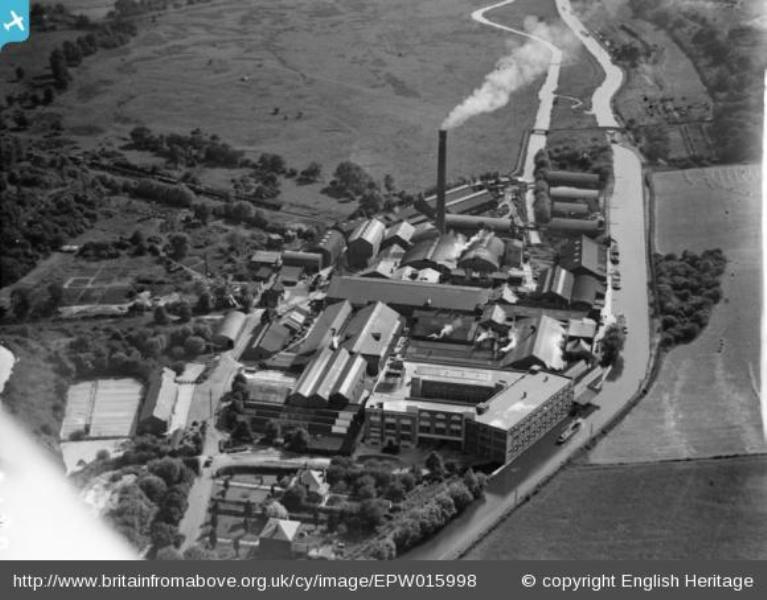 This photograph shows the mill with Croxley Common Moor above it. Working boats can be seen on the canal transporting various commodities to and from the mill. Esparto grass from the London docks or finished paper on its way to the Apsley mills to be processed. Towards the bottom of the photograph and alongside the right of the canal are the poles carrying the London to Birmingham telegraph system. 1926 - John Dickinson Mill. 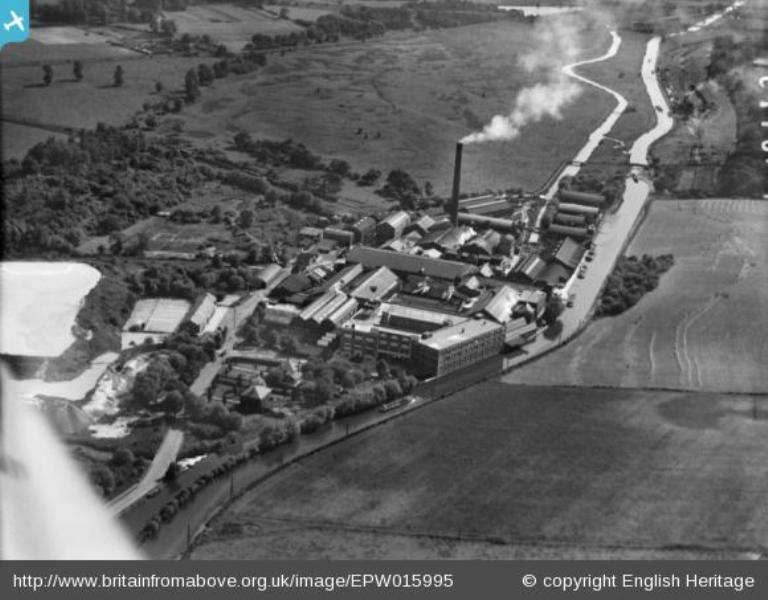 This photograph shows the mill with Croxley Common Moor above it. Working boats can be seen on the canal transporting various commodities to and from the mill. Esparto grass from the London docks or finished paper on its way to the Apsley mills to be processed. 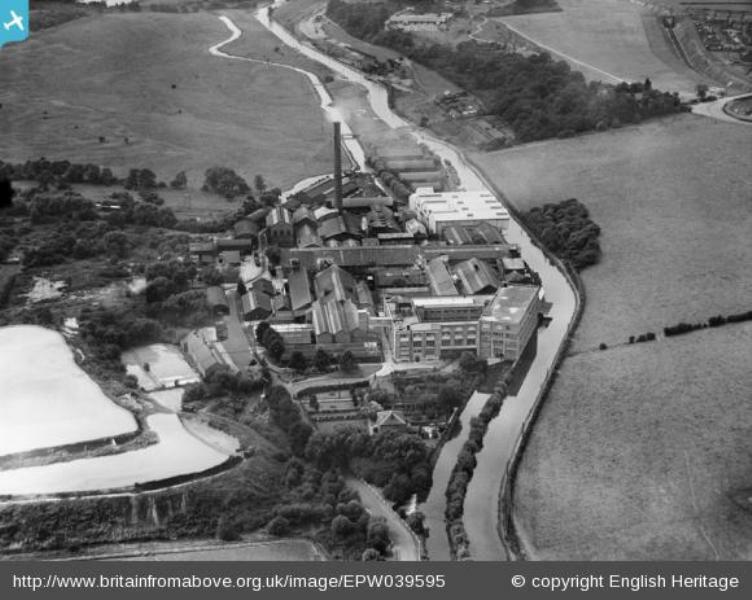 Property at the bottom of the photograph shows the mill Manager and Foreman’s detached houses. 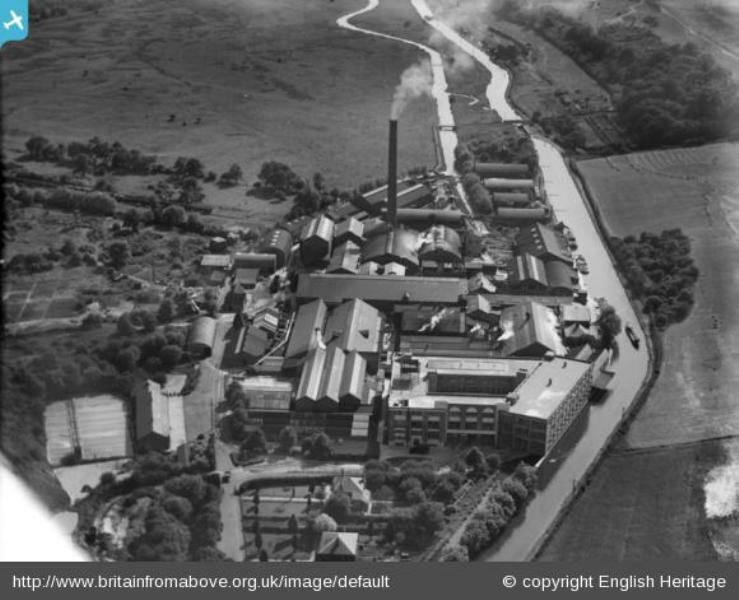 As the mill expanded they were demolished to make way for improvements to the mill. 1926 - John Dickinson Mill. 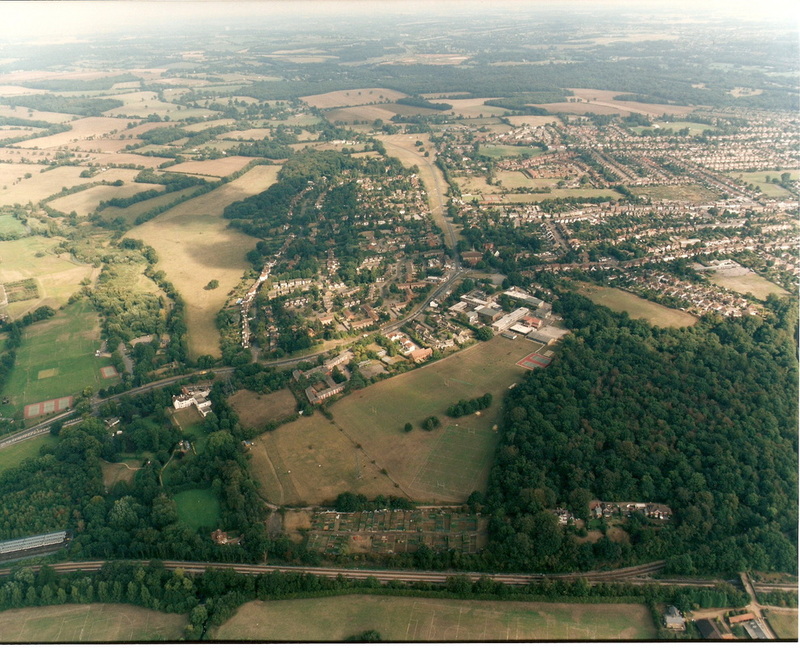 This aerial photograph shows the Watford Road sweeping the edge on the right-hand side. 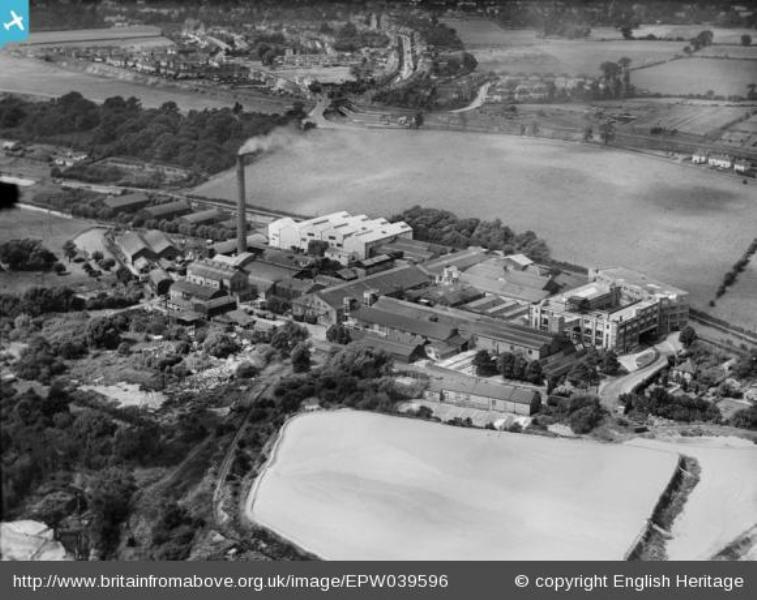 These fields would be taken over gradually from the 1930’s as part of the huge house building program from the 1930’s. 1926 - John Dickinson Mill. 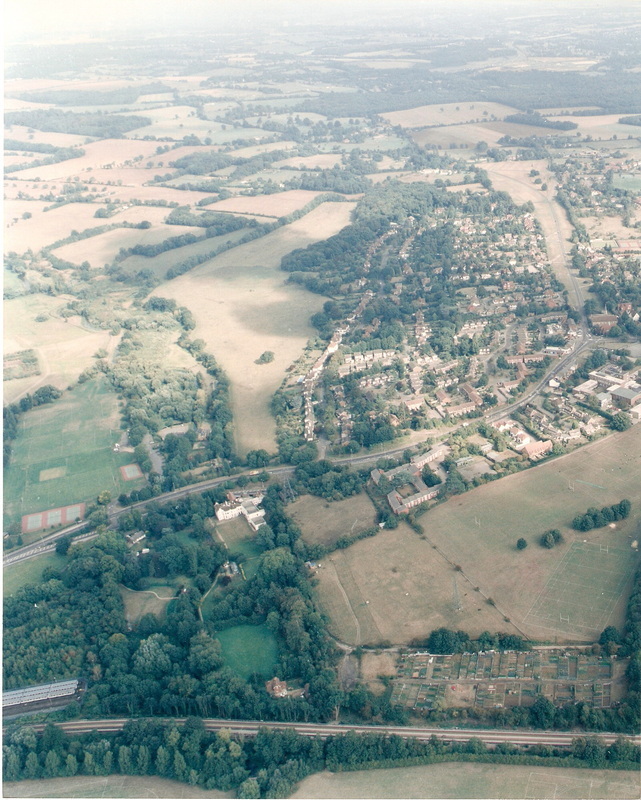 Approximately 2/3rds up on the right –hand side of this photograph the gardens and orchard belonging to Nuttfield House are visible. This house was built for one of the mill Managers and was the first house in Croxley Green to receive electricity and this came directly from the mill. The house was eventually sold to make way for the Frankland Road area and was originally called the Nuttfield Estate due to the fields in this area having the same name. 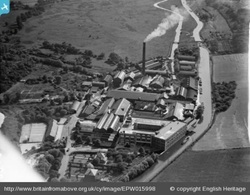 1927 - John Dickinson Mill. 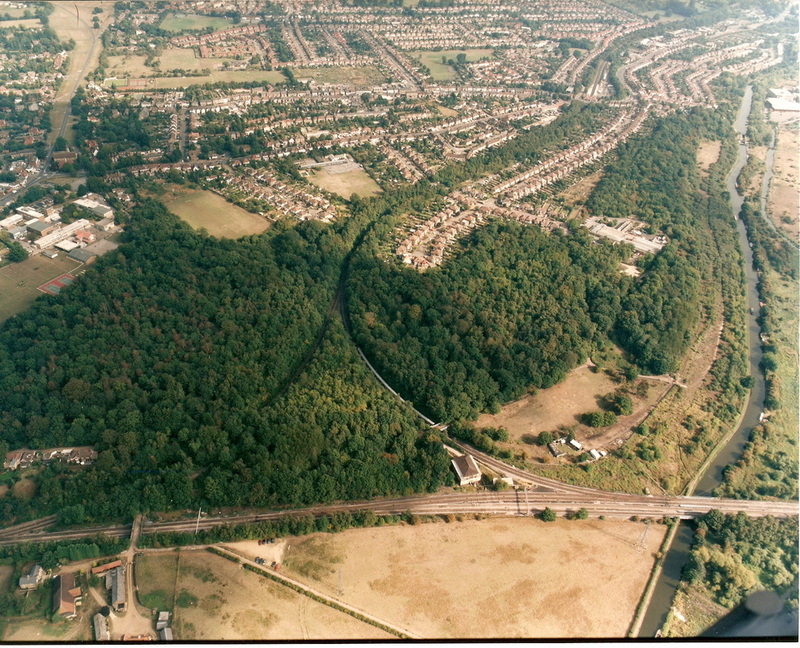 This photograph is showing the south of Croxley Green with the Watford Road running from left to right and above this the Metropolitan Railway cutting and bridge over Baldwin’s Lane followed by the viaduct that takes the line to Watford. At the bottom left hand corner just visible is John Dickinson’s own steam railway system which had access and was connected to the LNWR. This line ran from Watford to Rickmansworth and was known as the Ebury Line after Lord Ebury once owner of Moor Park, Rickmansworth. This line was taken up eventually and is now called The Ebury Way now a public right of way used by pedal cyclists and pedestrians. 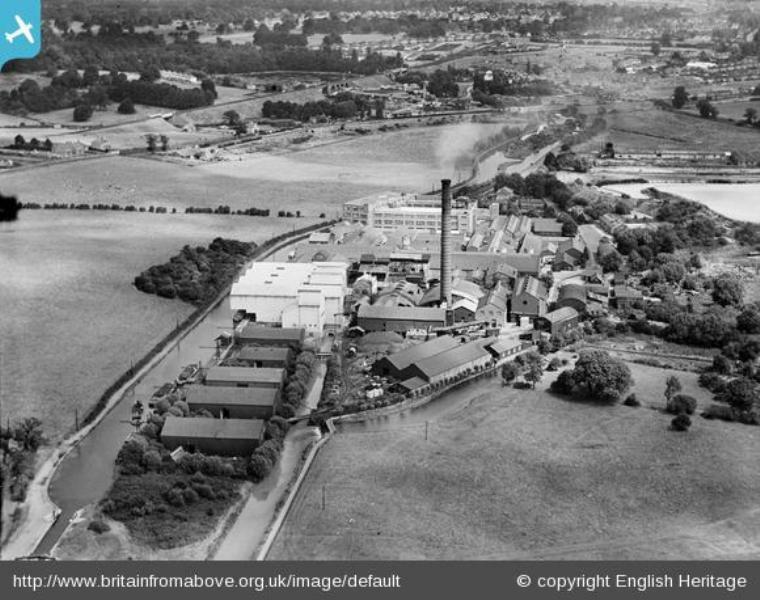 1927 - John Dickinson Mill. The John Dickinson’s railway towards the right clearly shows the track in use. 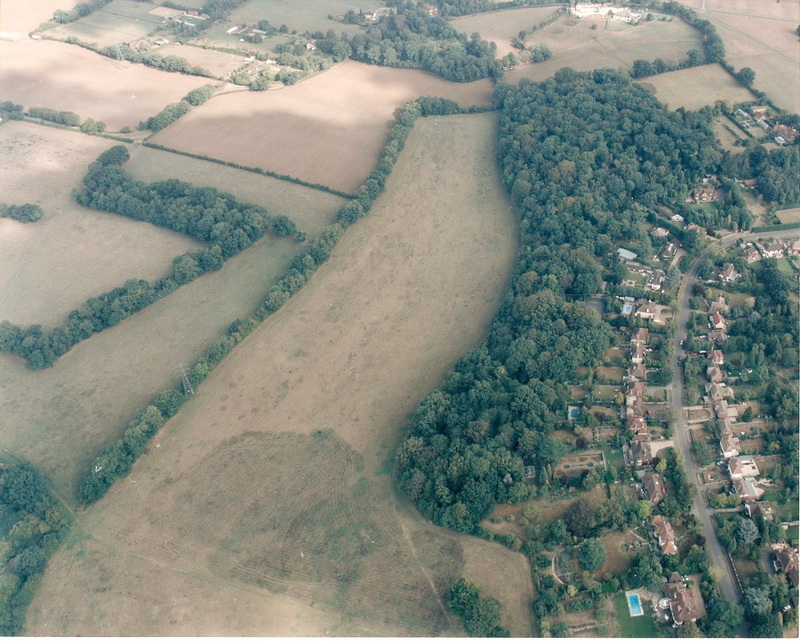 Croxley Common Moor is at the bottom and the canal lock is bottom left. A small lane with access from the Watford Road and opposite Croxley Station was a well known route to and from the mill for the workers living in and around the area. This is still a popular route today down to the Grand Union canal and Croxley Common Moor and is aptly named Mill Lane. 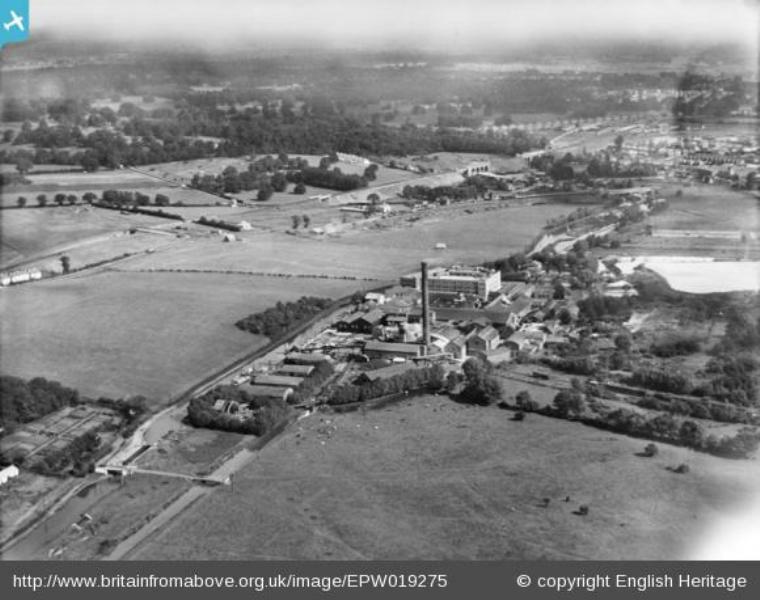 1930 - A general view looking across fields to Croxley Green. 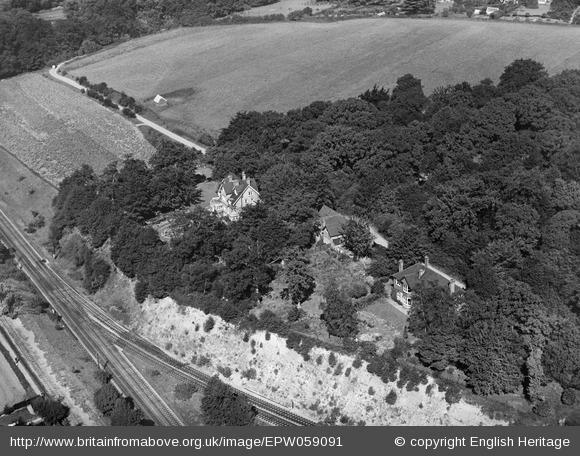 A railway line is visible centre bottom with passenger train on its way to Rickmansworth. The River Gade meanders across the view also on its way to Rickmansworth to connect with the River Chess and River Colne in the town area close by the Aquadrome. 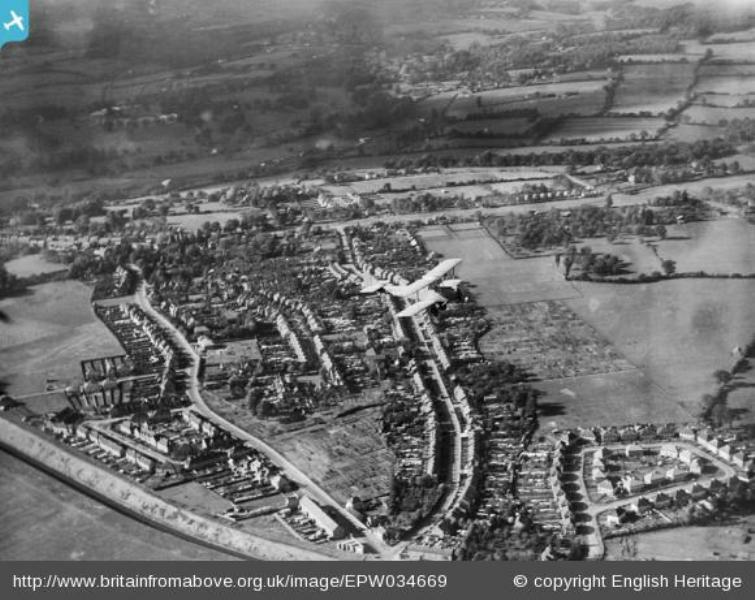 1930 - This aerial photograph with an aeroplane passing over Croxley Green and New Road begins to show the village now increasing in size. The railway cutting that was necessary to connect the mainline from Baker Street was constructed in the early 1920’s to Croxley Green just south of Sandy Lodge and Moor Park station. 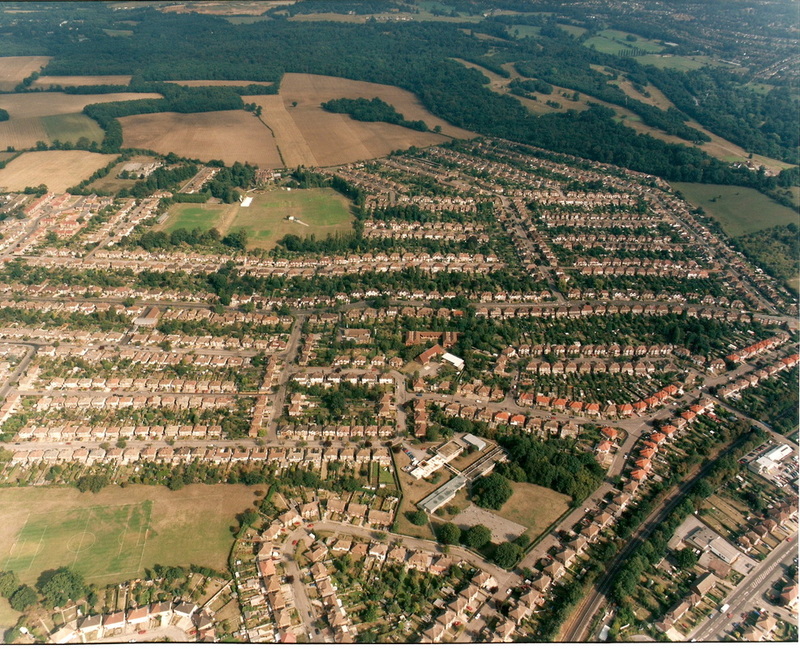 Springfield Close built by Rickmansworth Urban District Council is on the bottom right. 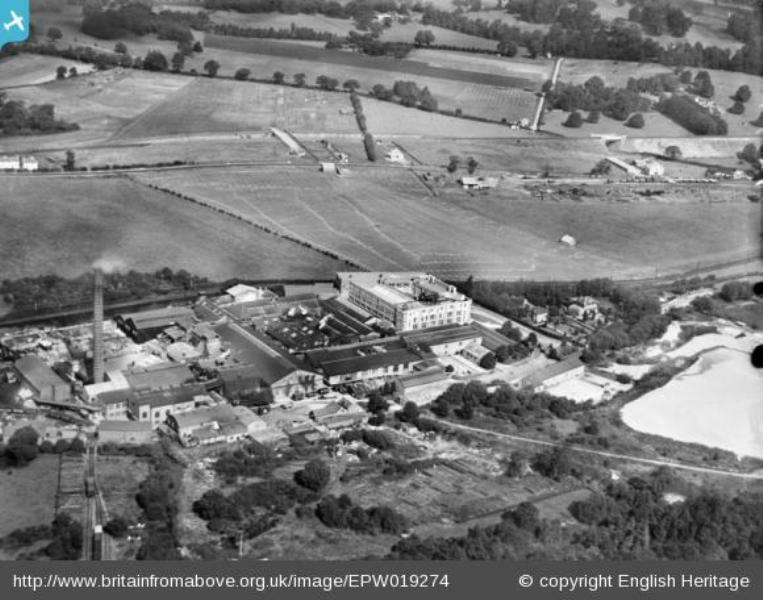 The Watford Road forms the left side of a V shape with New Road and the Croxley Green Station at point of the V.
1932 - John Dickinson Mill The view is looking north towards Watford at the top of the photograph. The Grand Union canal is on the left with the lock at the bottom. The River Gade passes the mill on the right that has been culverted through the mill and its powerful flow is used in the generation of electricity. It rejoins the river to the right of the sheds at the bottom of picture. Working boats can be seen bringing goods or being loading for transportation either to the London Docks or John Dickinson’s mills in the Apsley area. The tall chimney was necessary to take the gases from the bleach house away from the surroundings area. Long Valley wood is to the right of the furthest point of the mill. 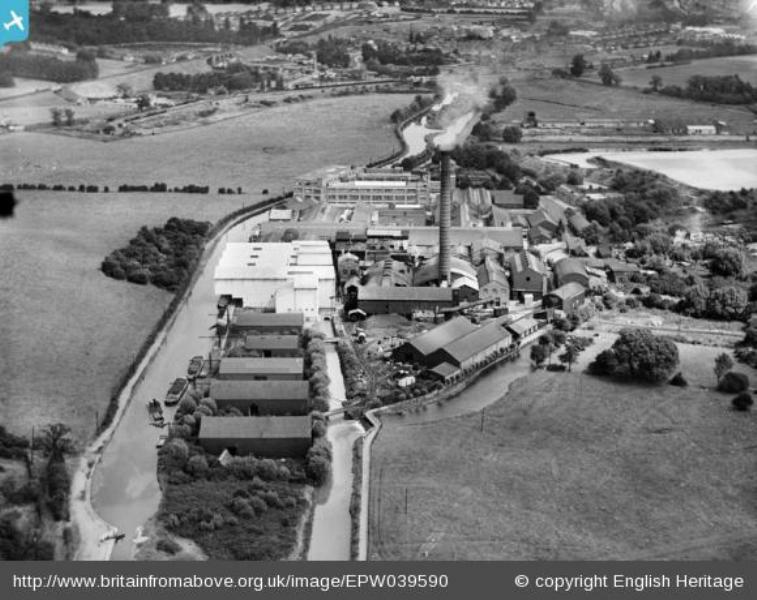 1932 - John Dickinson Mill. This photograph is from the other end of the mill. The canal is on the right, the River Gade to its left and a road that leads directly from Cassiobridge for road transport in/out of the mill. The chimney was a land mark for miles around and was necessary to take away the gasses from the bleaching system that contributed to the process to create white paper. 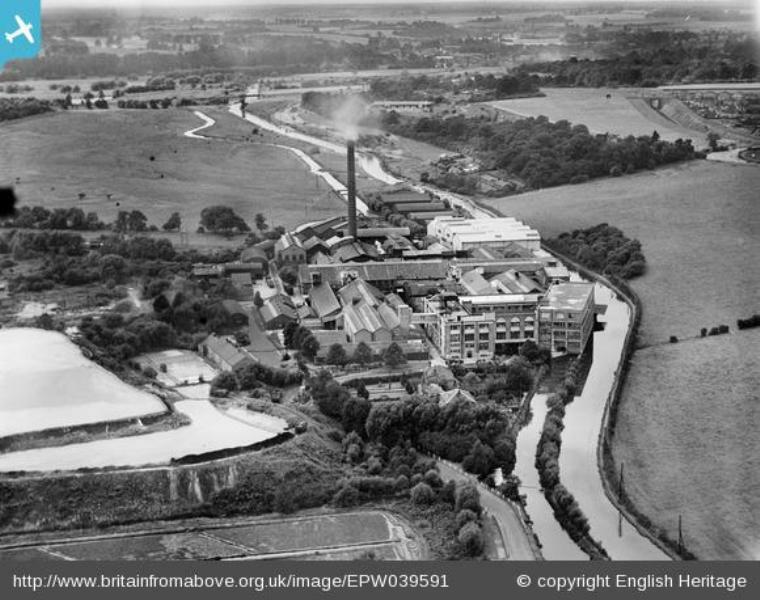 1932 - John Dickinson Mill The view is looking north towards Watford at the top of the photograph. 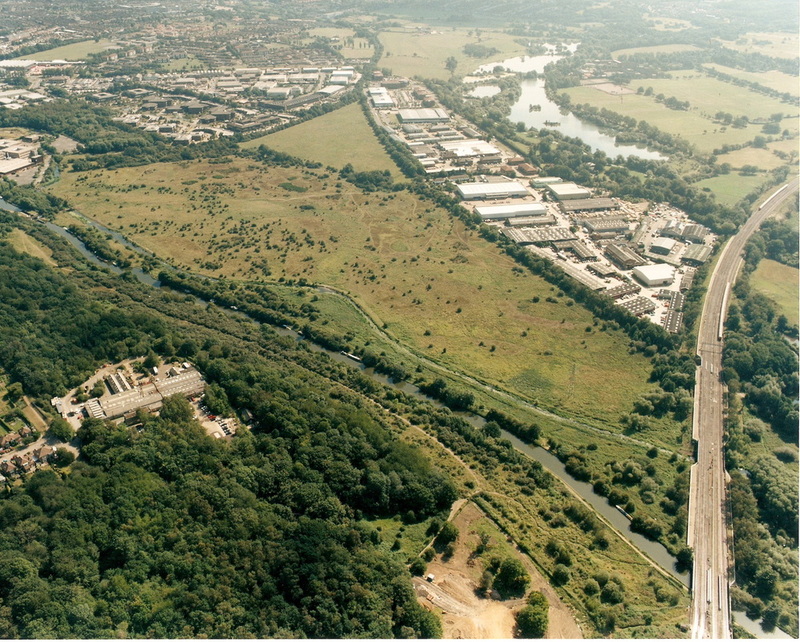 The Grand Union canal is on the left with the lock at the bottom. The River Gade passes the mill on the right that has been culverted through the mill and its powerful flow is used in the generation of electricity. It rejoins the river to the right of the sheds at the bottom of the picture. Working boats can be seen bringing goods or being loading for transportation either to the London Docks or John Dickinson’s mills in the Apsley area. The tall chimney was necessary to take the gases from the bleach house away from the surroundings area. Long Valley wood is to the right of the furthest point of the mill. 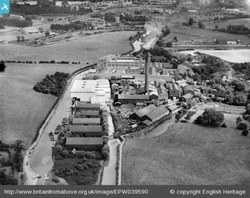 1932 - John Dickinson Mill. Busy activity to the left of the sheds that overhang the canal and these boats, a combination of barges and narrow boats, would ply their way up from the London docks delivering essential raw material to Croxley mill. These boats would then continue to the mills in the Apsley area with the large rolls of paper for processing into many forms of paper products including the well known writing papers, Croxley Script, Basildon Bond, Three Candles etc. 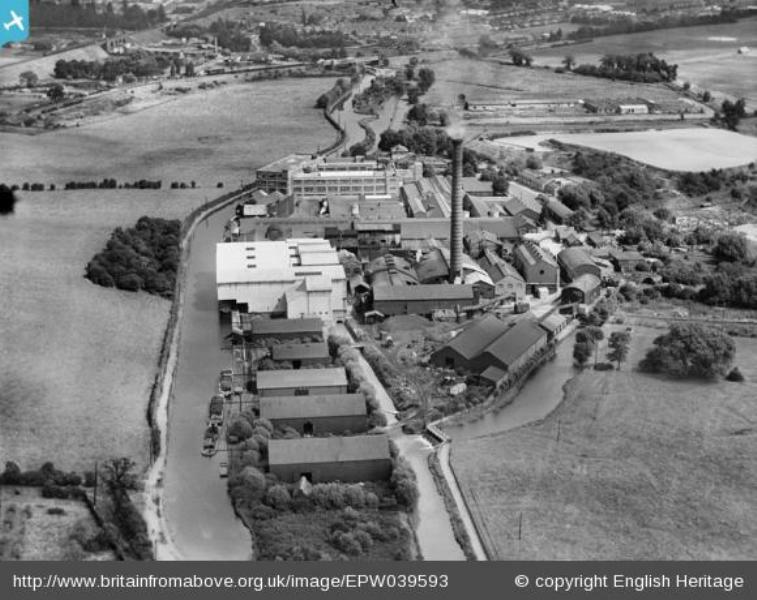 1932 - John Dickinson Mill. Croxley Common Moor in the foreground. This site was designated a SSSI site (Site of Special Scientific Interest) and upgraded by English Nature to a Local Nature Reserve. Croxley Green in the background has yet to receive the anticipated housing increase started in the early 1930’s which became known as ‘Ribbon development’ John Dickinson railway system is on the right connecting to the LNWR and Ebury Line. John Dickinson Company encouraged its workforce with many activities including many forms of sport. Many years, a rifle club had its own practise rifle range on an area of the site adjacent to the moor. 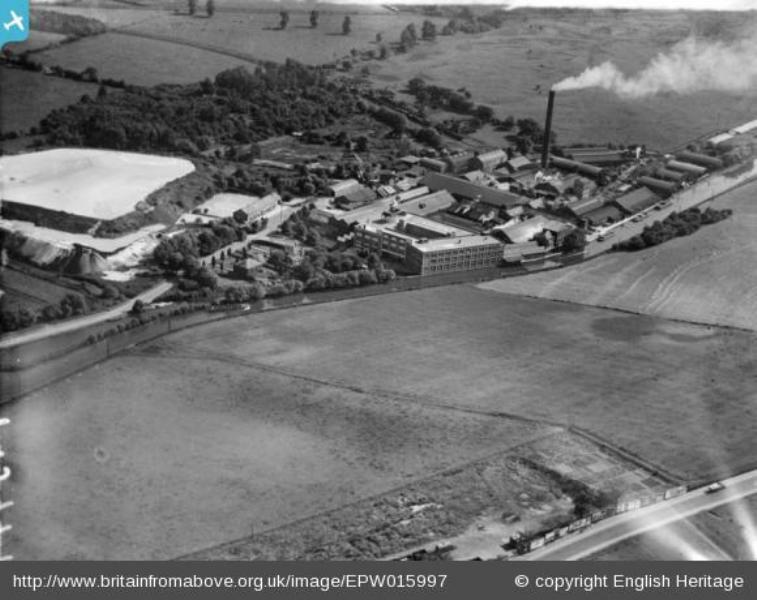 1932 - John Dickinson Mill. 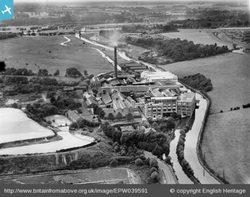 The settling beds to the left of the photograph – a large white area where the residue from the paper pulp process was left to settle and recycled again into lesser quality paper/card etc. 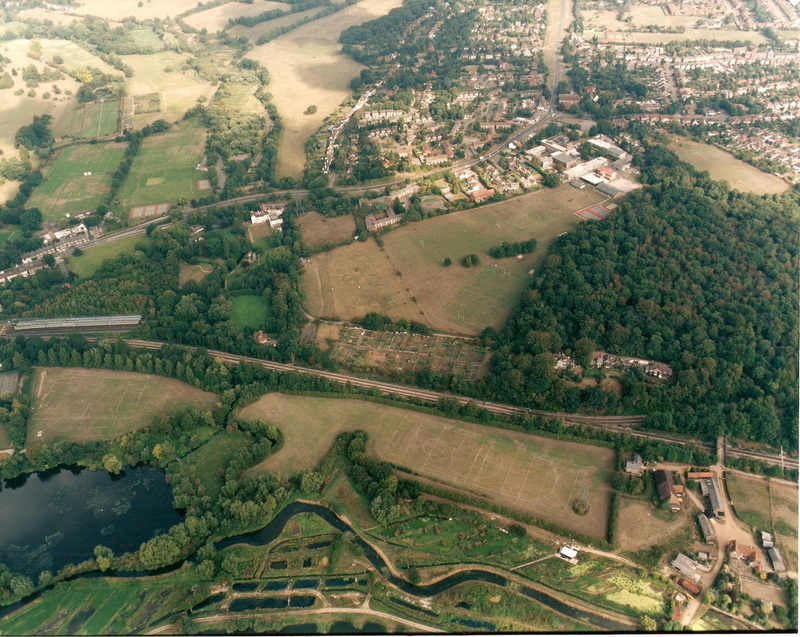 Towards to top of the photograph and right of the Grand Union canal is the remains of a productive area where Rickmansworth Gravel Company operated for many years. A washing and grading plant existed here for many years, following the extraction of gravel from the dry pits in Croxley Hall woods. The company moved down the valley to Rickmansworth when these were exhausted and commenced removing the material from the town’s wet pits. 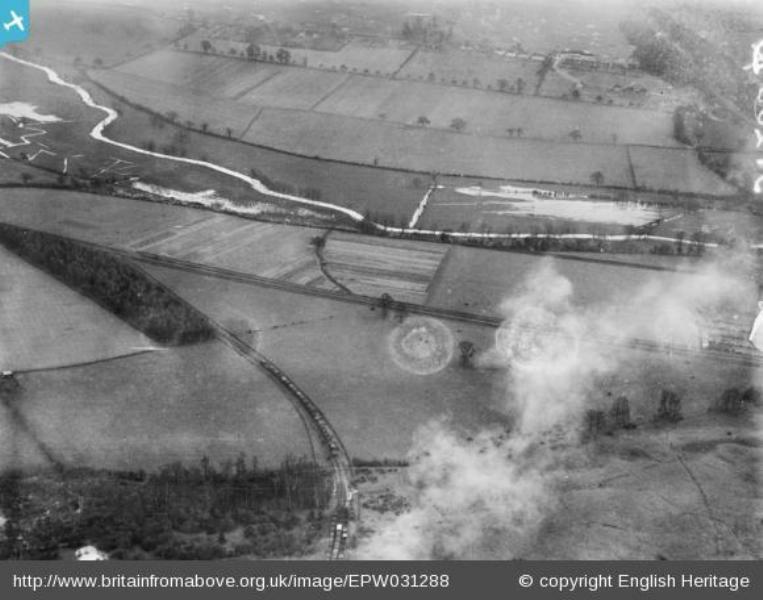 These in turn became lakes called Bury Lake, Batchworth Lake and Stockers Lake, collectively named The Aquadrome. The hogging from these pits was transported by barge and canal to the Croxley washing and grading plant and then onwards by rail trucks for use in the vast house building that was to be known as ‘Metroland’ When the original Wembley Football Stadium with its four towers was built as part of the British Empire Exhibition in 1924 the hogging used was processed at this plant. 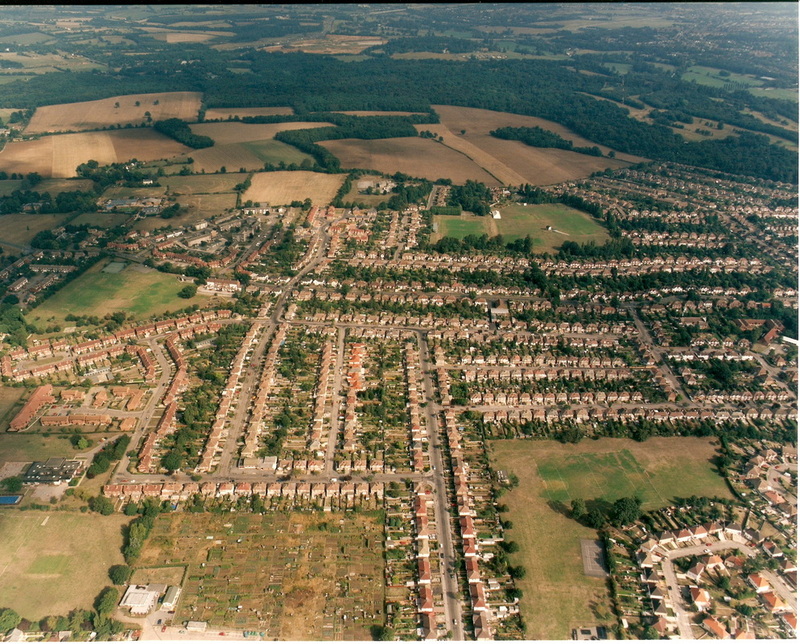 Later, when the London Underground system was being upgraded around the Neasden area the spoil was tipped at Long Valley, Croxley Green which is seen top centre. This included all manner of debris including china electrical conductors and this raised the canal bank side in a long stretch by some 20ft. 1932 - John Dickinson Mill. Paper production at the mill and the demand at this time meant the residue from the process became problematic as space for the settling process was limited. This can be seen bottom left of the photograph. The Washing and Grading plant mentioned in (595) shows the wooden bungalows in front of Long Valley woods that housed the family’s of the workers who operated the plant. 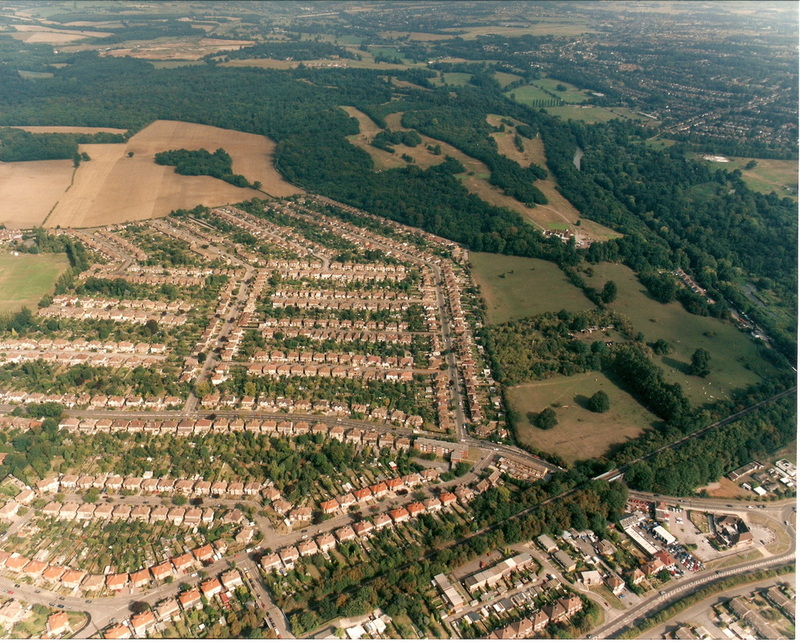 Properties nestled in Croxley Hall woods. The lane skirting the fields is Lavrock Lane that would lead to Scotsbridge House and Scots Hill. 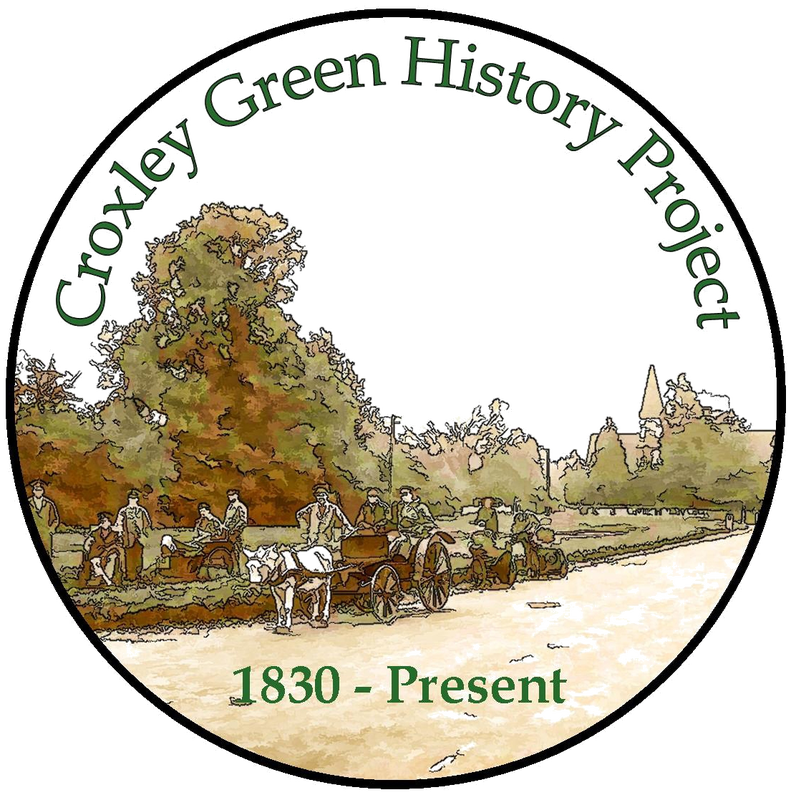 The photographs below were taken to give a 'snapshot' in time of Croxley Green and how it fitted in to the surrounding area and especially its separation from Rickmansworth and Watford. 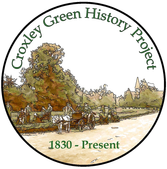 By doing this it would hopefully help to keep these two towns apart from Croxley Green. 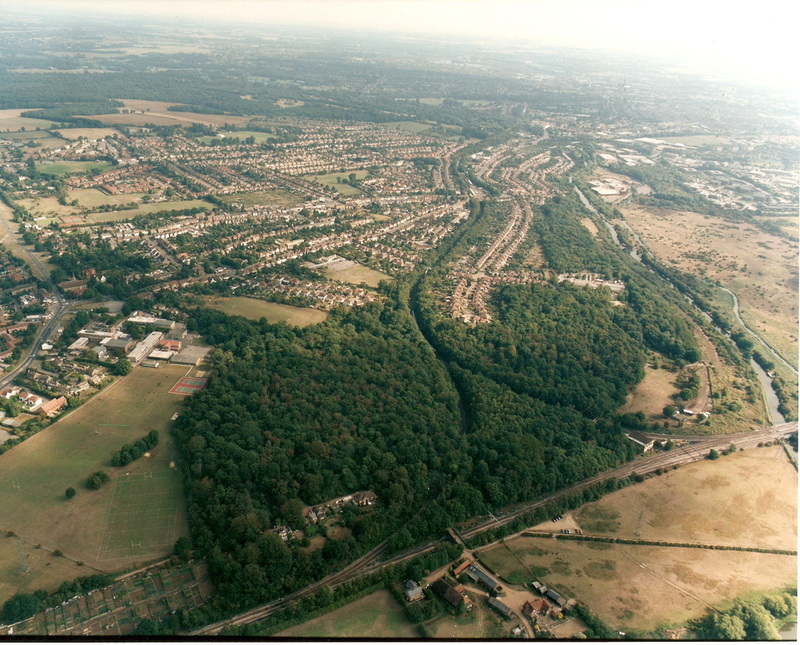 The view shows the Metropolitan railway line as it curves through Croxley Hall woods. Frankland Road and Frankland Close are just above the woods. 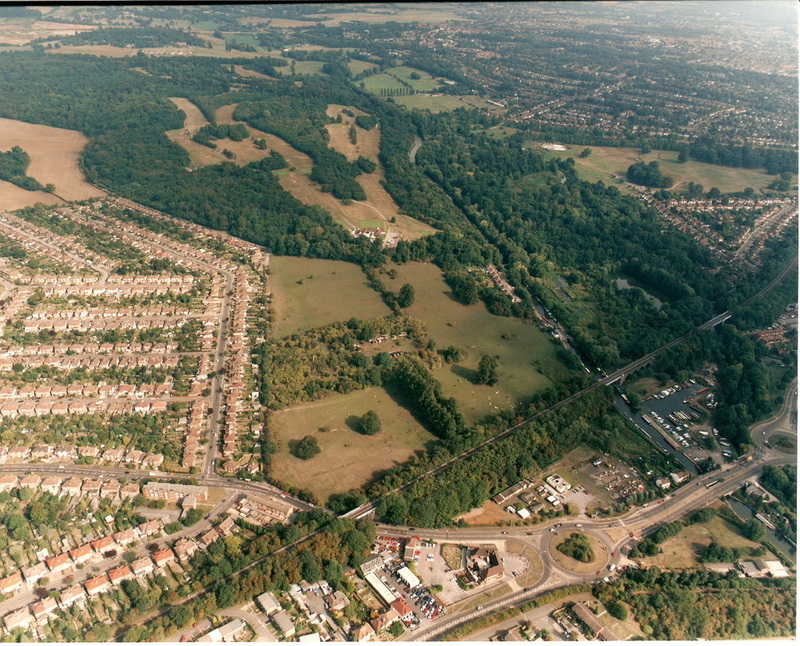 Common Moor can be seen centred and railway line to/from Rickmansworth curves from the right. Common Moor is central with the River Gade passing along side. 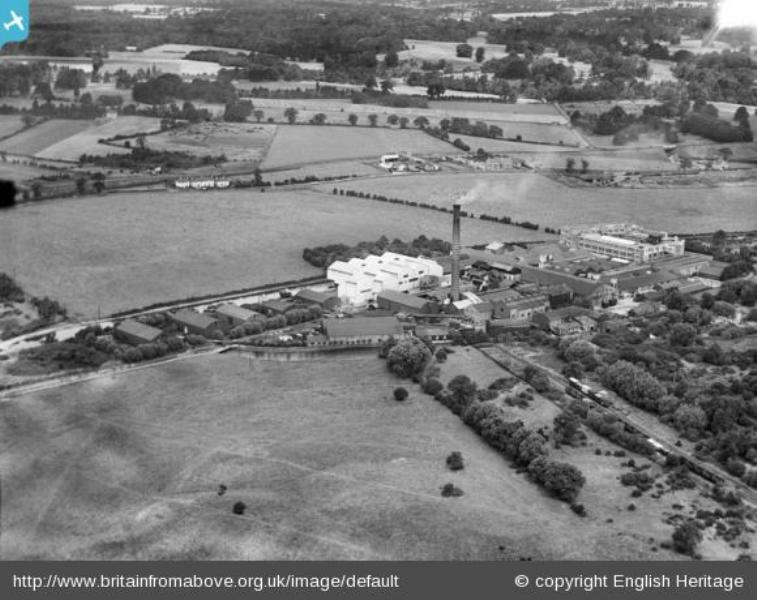 The IMC (Imperial Machine Company) can be seen in the woods now developed into housing. Bottom of Baldwins Lane and Links Way with the roads adjoining. 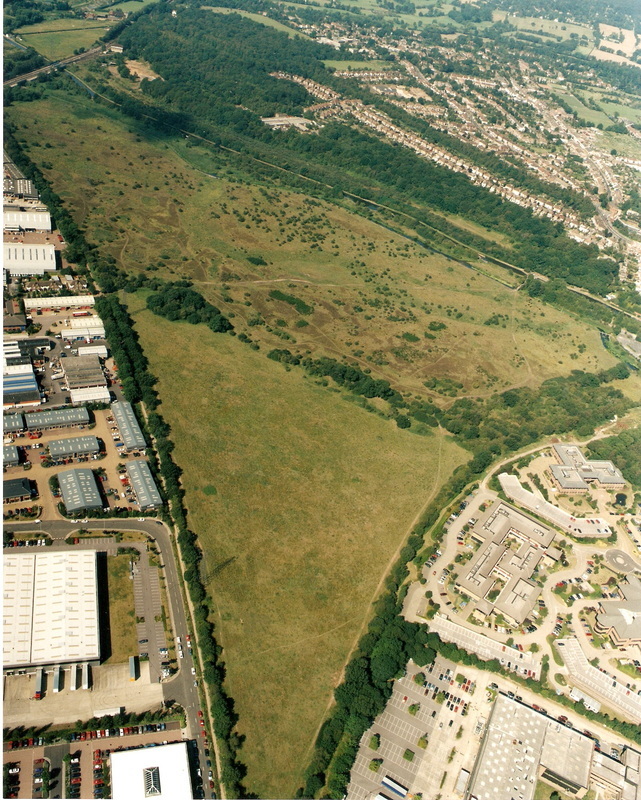 The open field area to the right of Links Way, previously the house and estate called Cassiobridge. 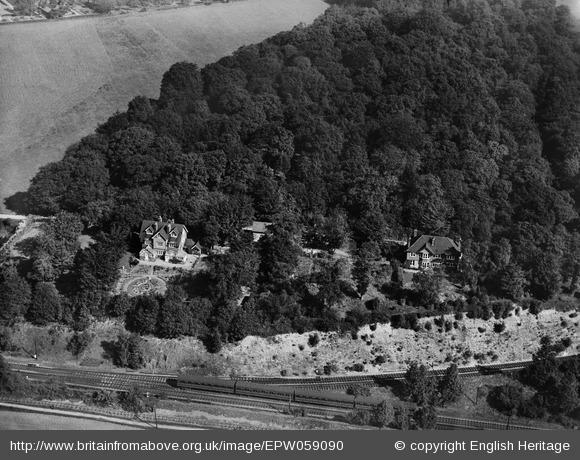 This area was also referred to as Snellshall when the Manor of Croxley Green was owned by Caius College Cambridge. Looking North Malvern Way School is seen centre towards the lower section with Winton Crescent to its left and Barton Way recreation ground. This view has Barton Way from the centre bottom heading upwards. The allotments are featured as are the Parish Office and Community Centre. 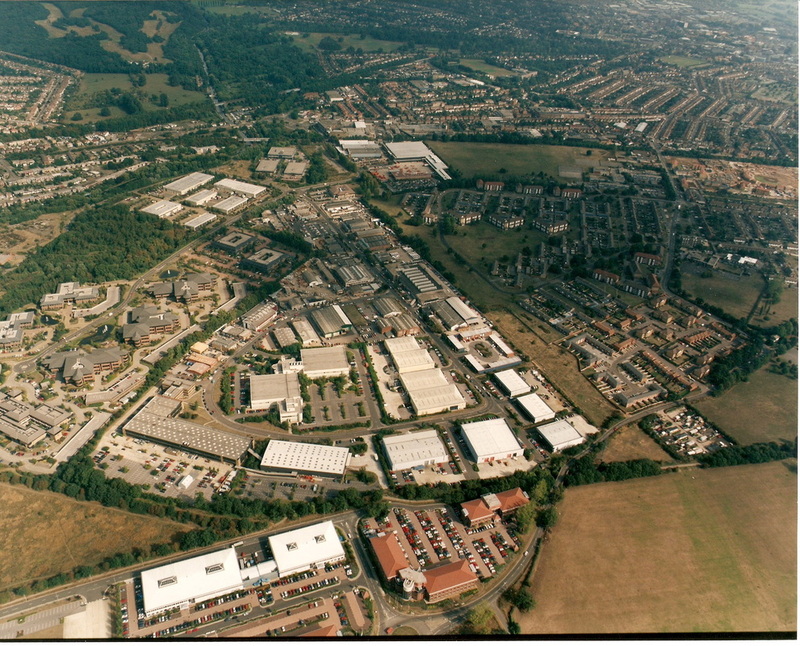 To the left is Common Moor also shown are the Business Parks off Moor Lane. 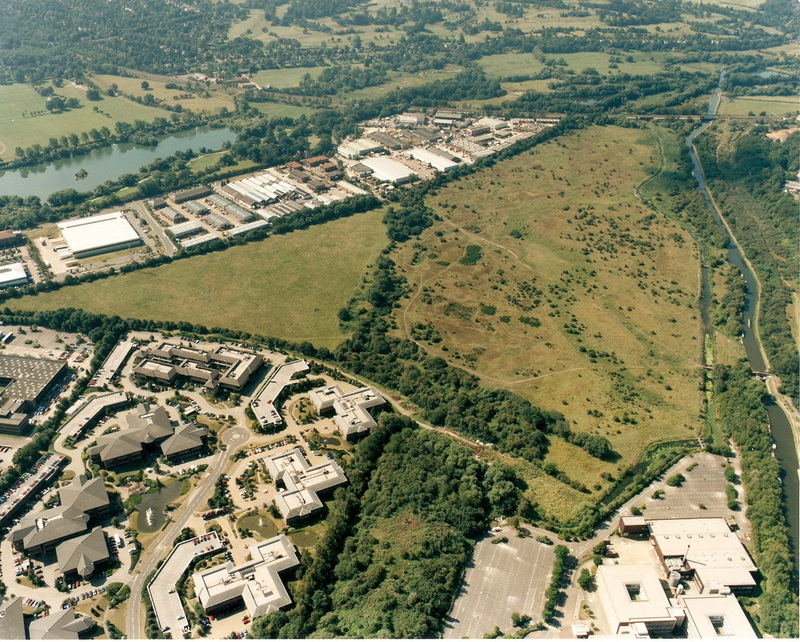 The Common Moor is just visible on the left and the Business Park on Moor Lane is evident. 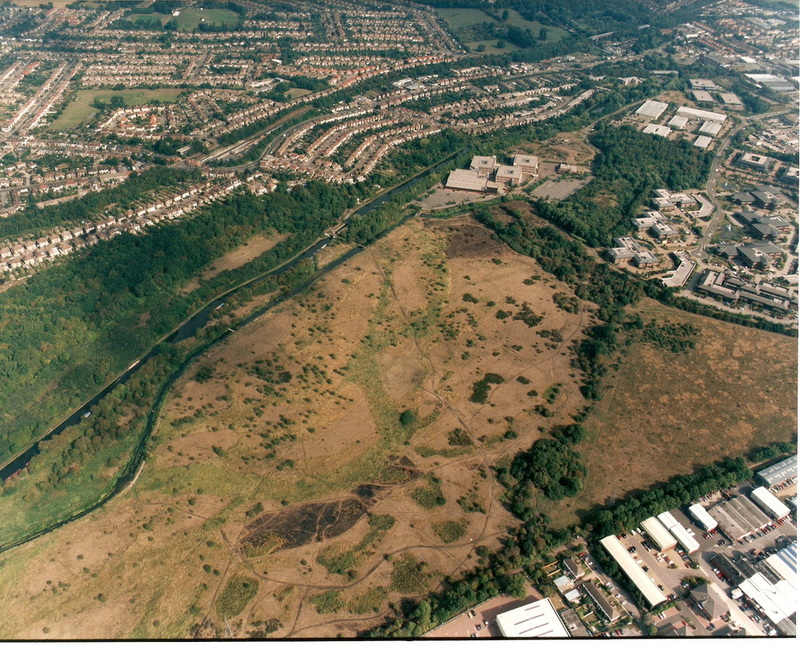 On the right are the River Gade and Common Moor. The buildings on the bottom right replaced the John Dickinson Mill paper mill when it was demolished. 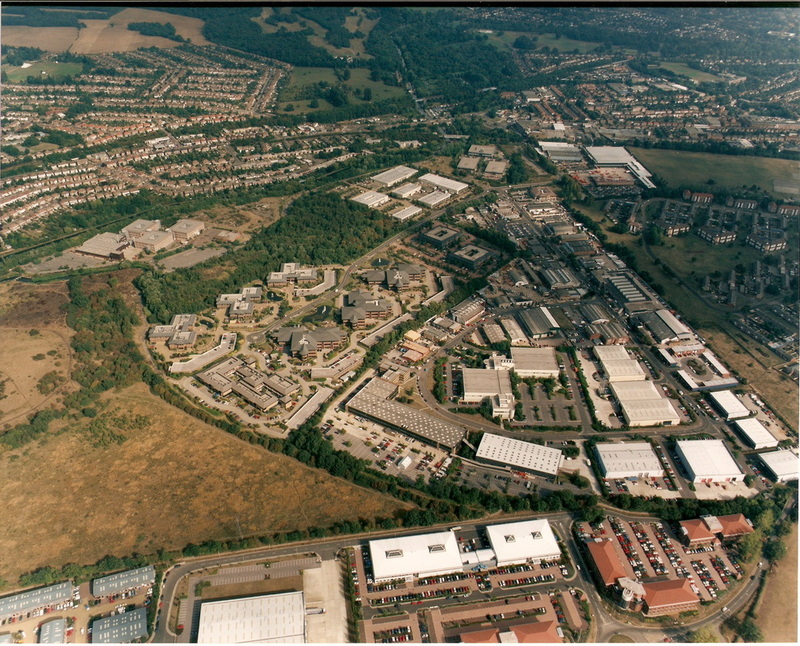 Standard Life and Marconi Underwater Systems once occupied the site. These were also demolished and is now The Bywaters Estate, the roads named after stationery produced by John Dickinson. 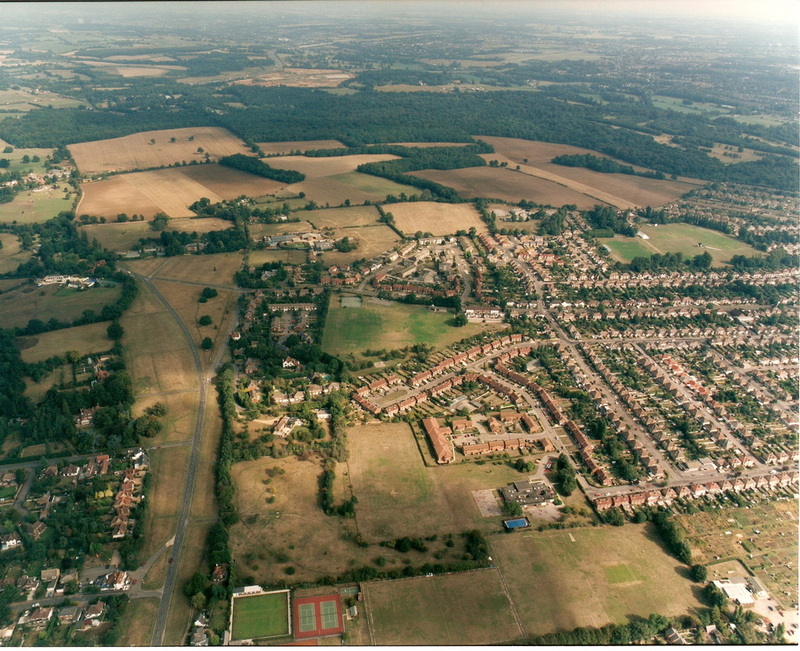 Common Moor is in the centre with a view towards Frankland Road and Frankland Close. This site was a SSSI (Site of Special Scientific Interest) and was upgraded to a Nature Reserve by English Nature in the mid 1990’s. 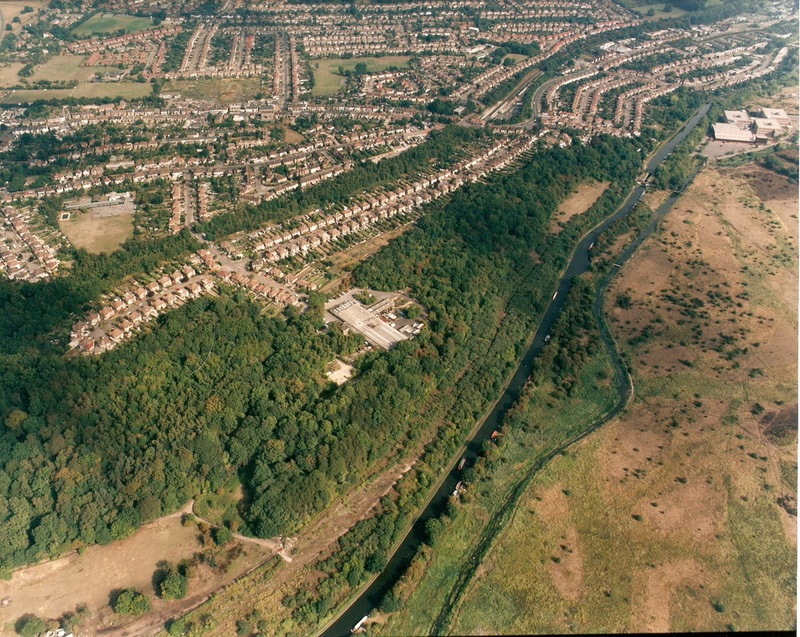 The Copthorne Road ‘Estate’ with The Green on the right of the photograph. 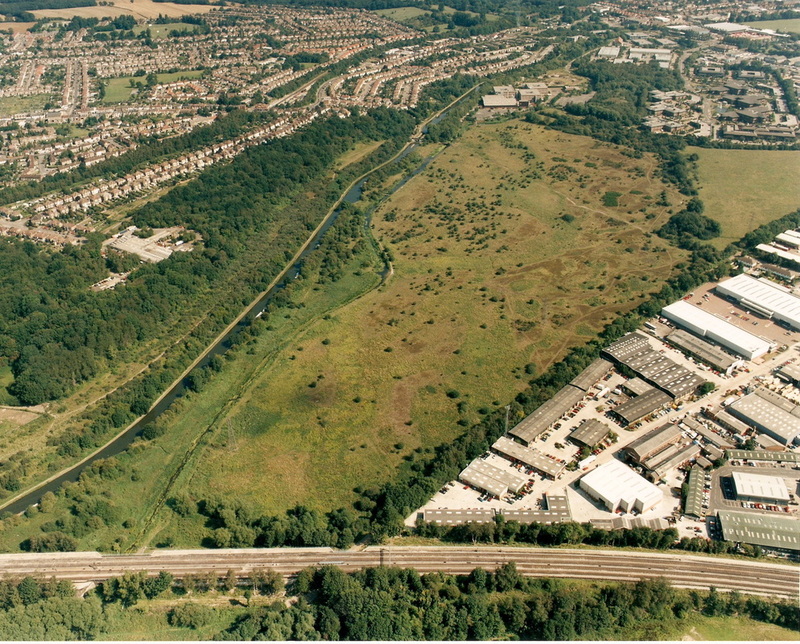 The River Gade is visible adjacent to Common Moor and the IMC Company positioned in the woods( now a housing estate) with Frankland Road and Frankland close in view. 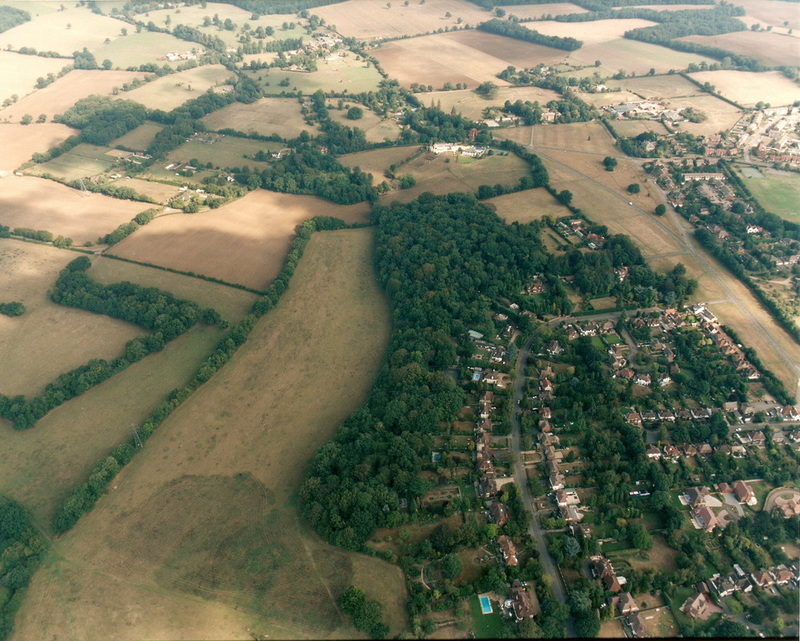 Croxley Hall Farm is on the right of the view below Croxley Hall woods. 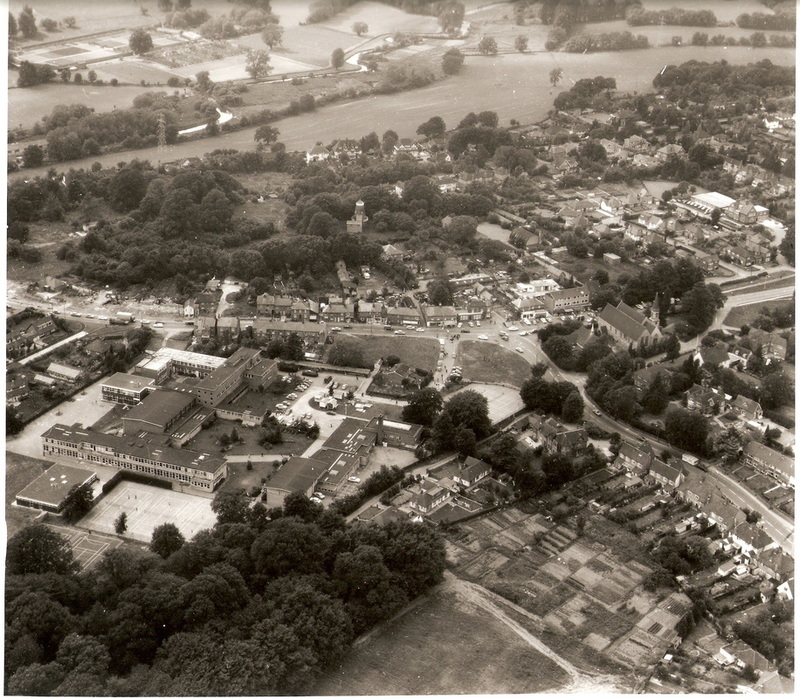 Rickmansworth School and grounds is central and Scots Hill able to be seen. Looking north the fields to the left of Copthorne Road ‘Estate’. Looking North the Metropolitan Railway line is left to right from Rickmansworth. 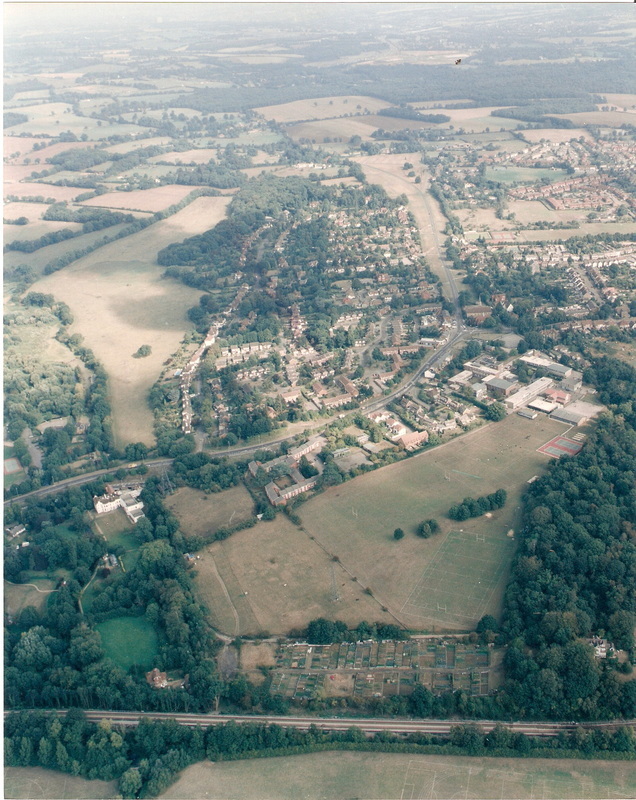 The allotments below Rickmansworth School and grounds and Scots Hill heads up towards All Saints Church and The Green with Sarratt village on the horizon. 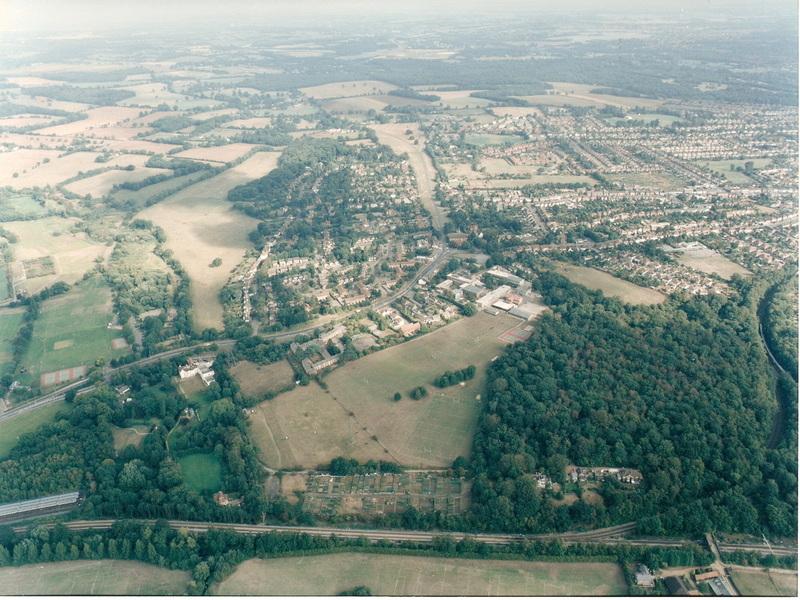 This photograph gives a panoramic view of almost the whole of Croxley Green and shows how its name depicts its special place within the surrounding countryside. Flames from an arson attack ripped through a Croxley Green farm and caused about £10,000 worth of damage. 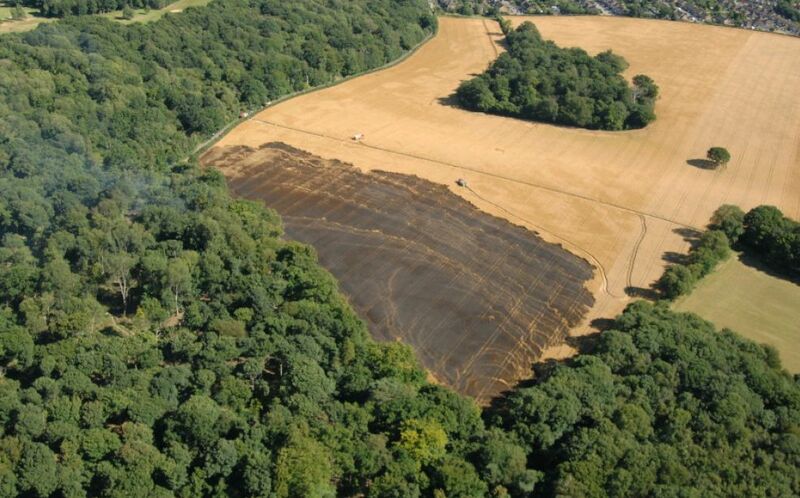 Six fire engines and 35 fire fighters were sent to tackle the field fire in Rousebarn Lane just after 3.30pm yesterday. About a square mile of wheat crops were damaged and witnesses saw two people, believed to be 12-14 years old, setting fire to the wheat.